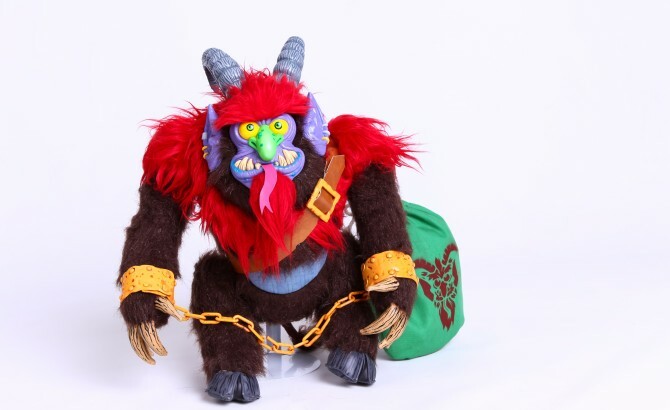 This toy is called "Don't Cuddle the Krampus" but I know none of you are gonna pay attention to that and snuggle the fur off of him anyway. You're always out there cavorting with dark entities after buying that occult-inspired shirt from the clearance rack at Urban Outfitters. Do your thing, I ain't mad at you. And really Warpo should have known that no one can resist hugging Santa's evil little friend if they're gonna make him so dang adorable. I love this time of year because I know Krampus is coming and is gonna beat some bad little heathens with sticks. If that was a tv special every Christmas I would lose my mind. You could make it like Scared Straight, where parents sign up their little monsters cause they've been bad all year, and then the scary goat man comes out and whoops em. You could put that on pay-per-view and be instantly rich. Can anyone help me make this happen, because I am seriously all about it. Ok, first you should support Warpo's Kickstarter for this dude, then you should give me whatever money you have left over for my show. This dude is a cool riff on the classic My Pet Monster toy, but unlike his predecessor, this one comes with three snot nosed kids who think they're tough one minute, until you flip em over to reveal how aware they are of the beatings to come. Just the thought of some little punks, plush or not, getting put in their place is enough to make me smile (hey, I used to work in a mall for many years, I've done my share of suffering due to unruly kids). You can support the campaign, and get yourself some pretty amazing rewards, by clicking on this link.